l depression with my first child three years ago and can't believe I feel so despondent with my life now. Any advice on how to get myself out of this pit? 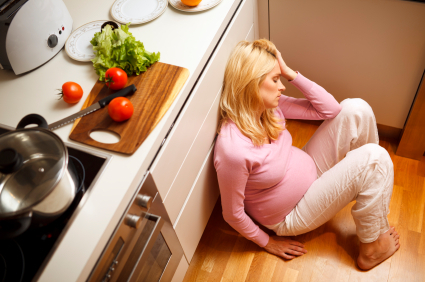 Prenatal depression certainly exists, and happens during pregnancy. It is not as widely known as postnatal depression. Why you? Well largely it is to do with your changing hormones and can be hereditary – another family member may have suffered from depression in pregnancy. Other causes often linked to prenatal depression are anxiety about your baby or problems that you may have had in previous pregnancies or financial problems to name a few. We also know that it is certainly linked to a women’s low physical health or low mental health at the beginning of her pregnancy. Here are a few common symptoms of prenatal depression if you want to check if these are happening with you. Lack of energy, lack of appetite, loss of interest, crying, anxious, fatigue, irritation, exhaustion – as you can see some of these symptoms mimic the feelings of pregnancy which is probably why is it is often missed. Depression can be mild, moderate or severe. The concerns with prenatal depression are two fold as firstly there are concerns as to how you feel and coping with feeling depressed on a day to day basis when this is supposed to be a happy part of your life. Then it is the follow on effects on your baby as in the care you take or are motivated to take of yourself during pregnancy. So you need to pay particular attention to your nutrition, exercise and sleeping habits for both your health and your baby. When I have worked with women experiencing prenatal depression they have little desire to eat or exercise so usually they have a daily routine and just stick to it, because it’s on the routine not because they feel like it or are motivated to do it. For example eat a banana for morning tea or go for a 15-minute walk late in the afternoon. You may need to get your partner or a friend to help you work a routine out. My other recommendations would be to seek some support and help as soon as you become aware that you are suffering from depression. Have friends or supportive family that you can talk to and assist you with everyday hassles or helping take care of your toddler. Take as much rest as you want to, exercise and avoid alcohol and caffeine. As most of us know we tend to use/consume these more when we are stressed. Pay particular attention to your nutrition and spend time with your partner. Also, educate yourself about prenatal depression, as there are resources out there in the community to assist you. Lastly, don’t suffer this alone; it is a recognized medical condition and if you haven’t got the support through friends and family you may need to seek other means of help.